Because there were only sugar cubes left in the corner store on Easter Sunday, when we ran out of sugar. Because it’s rained nearly everyday here in our neighbourhood, it’s almost like we’re living on the British Isle. We only made the cucumber sandwiches for fun. I wouldn’t really want to eat a whole one, because it’s kind of bland. 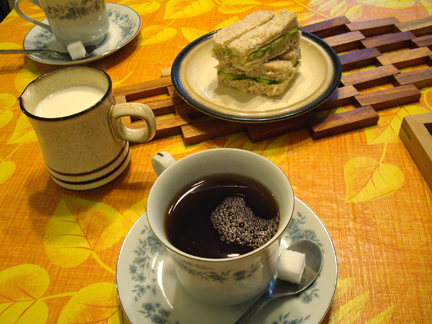 But if one is adventurous one could try fancier versions of the cucumber sandwich. Like this curried version, or these with mint and cream cheese. These open face ones on rye look pretty appealing too! Mike even hung up his British flag for the occasion (and found out that our door frames are made of metal! More surfaces to hang stuff with magnets! :D). 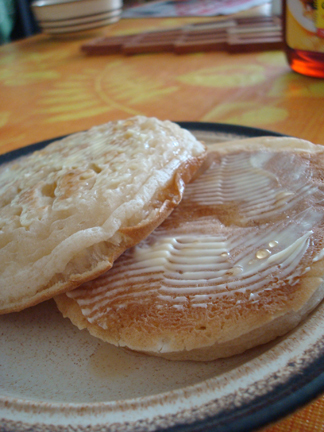 He also bought some crumpets for breakfast, because he’s a big fan of crumpets. … but they’re no pancakes. The syrup didn’t change the flavour much. Oh well. 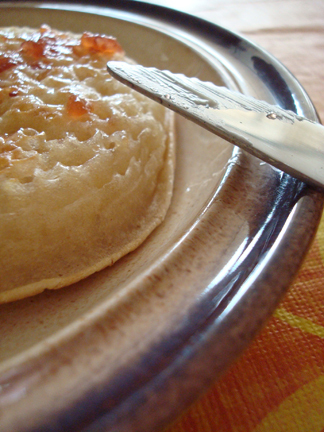 What are crumpets supposed to be eaten with anyway? Lots of people I talked to were kind of annoyed by all the exaggerated excitement and fascination around the royal wedding. And having planned my own wedding and enjoyed the complete absence of expectation from both of our families (they’re the best! ), I kind of wished that everyone would just leave the couple alone so they can have a private time of celebration. Well, I can only wish. But I think any wedding of two people who are deeply in love with one another is a happy occasion worth celebrating. 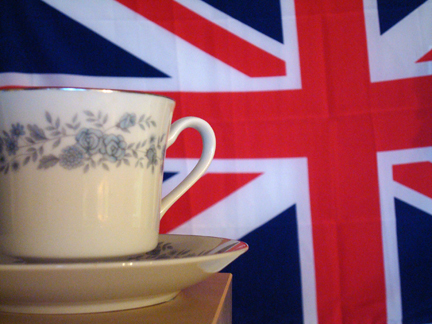 So the royal wedding just gave us a reason to do something fun and British (or what we think is British). But no, we didn’t stay up to watch it. But from the photos I saw afterward I think the prince and princess were genuinely happy, and for them I am happy. And I think it’s always good to find things to be happy about. 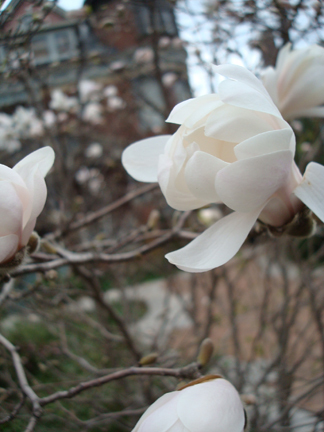 Like yesterday, I saw that the magnolia bush we walk by every week is finally blooming. They’re almost white this year. I remember that last year they were more pink. 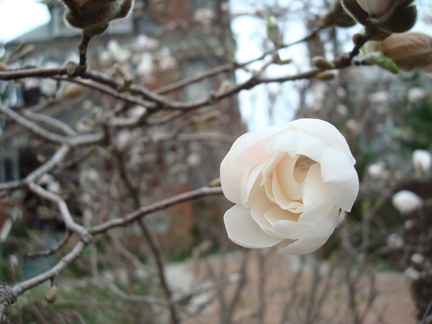 But look how graceful the soft petals are, unfolding. That made my day. I hope this week will bring you many things that fill your heart with joy. The Royal Wedding made my day too! I watched it live, because the time difference isn’t that big for us (I’m in the Netherlands) and it was so sweet. I’ve heard negative comments too, but I didn’t expect anything more than two people celebrating their love and that was exactly what I got. Love the magnolia, it’s my favourite tree. Although the blooming, sweet smelling lime trees in my street are also nice. I’m down here in the States near Chicago IL, and it was taking FOREVER for spring to arrive! Finally, we now have warm sunny days! Your emails/blogs are always delightful; thank you! Sometimes it takes me 2 weeks to get into my home email because my three kids reach the home computer before me. So I read all of them after the kids go to bed until late at night. Such a shame I have to get up early each morning to get to the office! 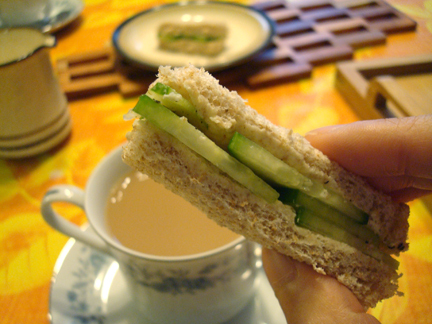 The secret to better Cucumber Sandwiches is a fine quality UN‐salted butter thinly spread onto the bread, and a sprinkle of black pepper on top of the cucumbers. Then we cover the sandwiches and chill them for a short time — they delicious when the cucumbers are really chilled and crunchy! P.S. The red‐colored sweet pepper jam tastes better than the green‐colored one.